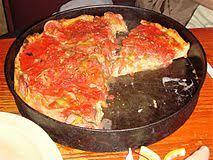 Chicago-style pizza is pizza prepared according to several different styles developed in Chicago. 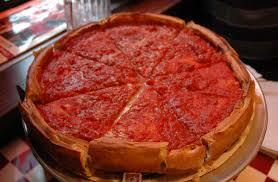 The most famous is deep-dish pizza. The pan in which it is baked gives the pizza its characteristically high edge which gives a lot of space for large amounts of cheese and a chunky tomato sauce. 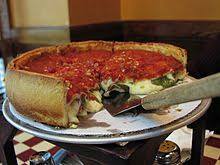 According to Tim Samuelson, Chicago’s official cultural historian, there is not enough documentation to determine with certainty who invented Chicago-style deep-dish pizza. 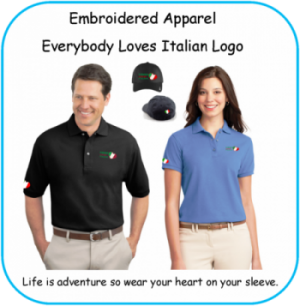 It is often reported that Chicago-style deep-dish pizza was invented at Pizzeria Uno in Chicago, in 1943, by Uno’s founder Ike Sewell. However, a 1956 article from the Chicago Daily News asserts that Uno’s original pizza chef Rudy Malnati developed the recipe. The thick layer of toppings used in deep-dish pizza requires a longer baking time, which could burn cheese or other toppings if they were used as the top layer of the pizza. 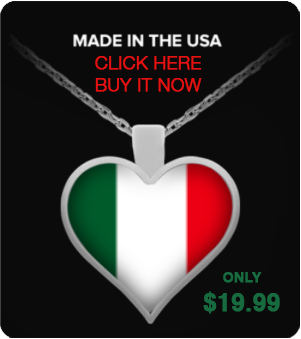 Because of this, the toppings are assembled “upside-down” from their usual order on a pizza. The crust is covered with cheese (generally sliced mozzarella), followed by various meat options such as pepperoni or sausage, the latter of which sometimes is in a solid patty-like layer. Other toppings such as onions, mushrooms and bell peppers are then also used. An uncooked sauce, typically made from crushed canned tomatoes, is added as the finishing layer; though sometimes, a sprinkling of Parmesan cheese is added for extra flavor. It is typical that when ordered for carry-out or delivery, the pizza is uncut, as this prevents moisture from the sauce and toppings from soaking into the crust, causing the pie to become soggy.